First and FOREMOST please remember that a locking bag IS NOT a five million dollar safe. People crack even those!!! It is just an added measure of security to keep the honest people honest or act as a deterrent to keep out unauthorized persons from easily gaining access to the inner contents. If someone has the time and will to gain unauthorized access - THEY WILL! They could cut the bag, pick the lock, drill the lock and so on. Think of a bag as a tool. You would not use a pair of scissors to dig a trench, so try and pick the best tool for the job/purpose at hand regarding your bag selection. In selecting a bag (s) there are some very basics that people overlook many times so we will list them in very plain order below! SIZE - Consider what is the largest item ( left to right - up and down ) without any folding or bending of the object going into the bag. KEYS - Who do you want or not want to have access to keys??? As stated above, size is the number one consideration on the list. For example, if you are putting 8-1/2" x 11" standard size paper in a bag, and you are only putting fifteen sheets inside you do not have you worry about thickness. But if you are putting in six hundred sheets of paper, you need to start thinking about over sizing the bag for your heaviest workload. Most mainstream thinking people would prefer to put five pounds of potatoes into a twenty pound sack instead of trying to fit twenty pounds into a five pound sack! We have included an image here which can serve very nicely as a reference starting point. 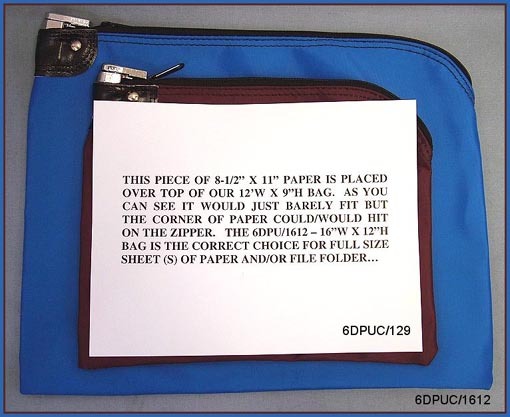 The darker ( burgundy ) bag, underneath the 8-1/2" x 11" piece of paper, is our #6DPUC/129 - 12"w x 9"h bag. Yes, this bag is overall larger than the piece of paper but you need to be able to place the paper inside the bag easily. Most people would want the document ( s ) to go straight into the bag-landscape without having to angle it up under the lock mechanism on the left side in this picture. But as you can see this would still be the WRONG bag which the picture depicts because the paper would hit the zipper in the upper right corner as shown here. The bottom ( royal blue ) bag shown here, is our #6DPUC/1612 which measures 16"w x 12"h. You can uneventfully put 8-1/2" x 11" paper right down inside this bag and those documents could even be inside standard manila size file folders and fit with room to spare. As an additional reference point you could put a full ream of 500 sheets of 32lb. paper in this blue bag shown here. 1.) Does the bag start out empty? 2.) If the bag starts out empty, does it get locked after intended recipient places contents inside? 3.) Does the bags ALWAYS have contents inside? 4.) Does the bag get transported from point A to point B (say from a central office to another location and than back to the office)? 5.) Does the courier have any business having access to the contents during the transportation process? KA-KEYED ALIKE - ALL keys are the same - identical - twins - carbon copy! Ex. - You order 2 bags you get four keys they are all the same! RK-RANDOM KEYED - Every bag has its own two unique keys - Ex. - You order 2 bags you get four keys, set of 2 for the one and a set of 2 for the other but the 2 sets of are different from one another. RKM-RANDOM KEYED MASTERED - Ex. - Every bag has its own two unique keys - Ex. - You order 2 bags you get four keys, set of 2 for the one and set of 2 for the other but the 2 sets are different from one another. - Difference? You can get a MASTER KEY that opens ALL your bags no matter how many you get. This is IDEAL for operations that have over three bags. That way back at the central receiving you need only one key to open all your bags as they come in. THIS SYSTEM WILL ALWAYS GIVE YOU MORE OPTIONS FOR KEY CONTROL AND CAN HELP IMMENSELY FOR POSSIBLE CHANGES IN YOUR OPERATION DOWN THE ROAD!!! If you need a locking bag do yourself a HUGE favor. If you do not take the time to read our webpages that is fine, but please take five minutes and read this page ENTIRELY !!! It will be a BIG help to you !!!!!!!!!!!!!!!!!!!!!!!!!!!! ALL bags come with two keys regardless of locking system!! Also, it is important to understand that no bag opens up to 100% of the overall width. You have to take into consideration things like the zipper slider, zipper top and bottom stops, and overall construction of the bag. Different style bags will have various size opening ( mouth ) widths depending on the bag construction. For example, our stock TAB series of bags are 12" overall in width but the actual opening is around 10". Our seven ( 7 ) pin system #7PPU is the style lock where you NEED the key to interact with the bag. Meaning you need the key to unlock the bag of course, but you can not lock the bag without the key. When unlocking the bag, the key stays in the lockhead until bag is locked. The lock does not allow the key to release out until the bag is locked. One advantage is that you can't lock the key in the bag by accident. Disadvantage - everybody who uses the bag will need to have a key! We also produce a six ( 6 ) pin lock that will behave the same way. Think out or sketch out how your bags and keys are going to be handled and by whom. Below is a little question/checklist to hopefully help.